Four species of clivia hail from the woodland stream banks in South Africa, beautiful to grow in frost-free subtropical climates or as indoor potted plants where winters are too cold. With strappy green leaves that look like those of an amaryllis, clivia foliage is evergreen. Any time from winter to summer, they produce a stalk bearing a cluster of orange to yellow flowers. Always grow clivias in a fertile and gritty but moist, well-draining soil in partial/dappled shade or bright, diffused light. Never overwater, especially in winter. Lift the clump of clivia bulbs with a garden shovel, taking care not to pierce the soil too closely to the base of the bulbs. For potted plants, invert the pot and gently shade or tap it until the bulbs and soil mass slip out. Avoid cutting or damaging any of the fibrous roots emanating from the bulbs and gently nudge and pull at the bulbs to dislodge them from each other. Gently spray or moisten the bulb mass with a stream of water from a garden hose to help lubricate the bulbs to help pull them apart. Use a large knife blade to help pry larger denser clusters of bulbs apart. Try to diminish the number of roots you damage or sever with the knife as you jostle bulbs part. Consider wearing gloves if the bulb mass is overly wet and slippery if water was used in Step 2. Cut off any smaller bulb offshoots from the main mother clivia bulb with the knife if you need to reduce the size of the clivia clump further. Immediately coat the cut wounds on all bulbs with a dusting of an anti-fungal powder such as ground cinnamon, flowers of sulfur or copper oxychloride. Replant the bulbs in their new garden spot or container, matching the depth in the soil where they were previously growing. The soil must already be moist, but not soggy, and rich in sand, compost and topsoil. Do not water the bulbs after planting for the first seven days so no rot is encouraged on any cut bulb wounds treated with the anti-fungal dusting, as recommended by the American Clivia Society. You can divide healthy clivia bulbs any time of year when the temperatures are above 55 degrees F, but in general the divisions are always best conducted in early spring. This results in faster plant recovery heading into the spring and summer growing season. 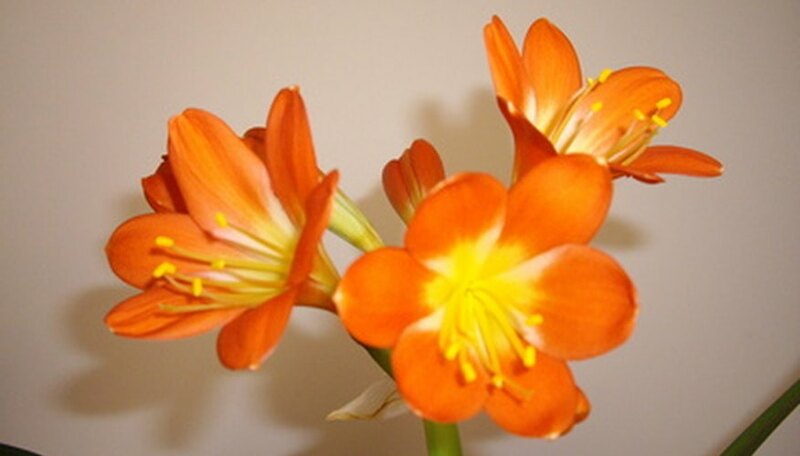 You may soak the barerooted clivia bulbs in a solution of Superthrive for two hours before replanting if desired according, to the American Clivia Society. Shake off excess liquid from the bulbs and roots before planting in soil. Overall, clivias resent root disturbance, so don't be eager to divide plant clumps every year. Allow plants to grow large and robust and reach a point that their vigor or flowering wanes or a potted container is so full that a division is truly warranted.